Having an indoor cat isn’t as easy as having an outdoor cat. 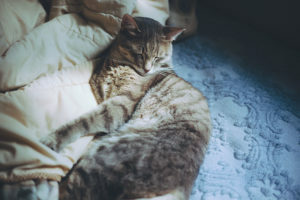 Not only do indoor cats typically need more attention, there’s plenty more you need to do to ensure a house cat stays physically fit and mentally stimulated than if you simply let your cat spend time outdoors. But I’m on the top floor of a 7-story apartment building, and even if I were to move into a house, letting my cat out is not something I’d be comfortable doing. I’ve heard way too many stories from pet owners who have had a cat lost or run over by a car to be okay letting Avery out when we finally have a garden again – unless of course it’s cat proofed and he’d be adequately fenced in. I’m also not a fan of outdoor cats’ influence on the environment, and the sheer volume of birds they manage to kill. But that’s a story for another day. For today I’m going to give you a peek at what a typical day for Avery currently looks like. His routine changes regularly, probably around once a month, as I’m always adjusting it when I think of ways that might benefit keeping him entertained and engaged throughout the day. 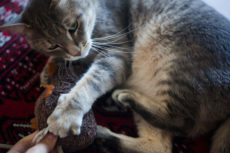 He’s not an easy cat to engage, especially when it comes to play time, and so a lot of the things I do are specifically done because I have to work around his lazy-bones personality. Another thing that’s important to note – I work from home and so does my husband. Avery’s rarely ever alone, and if he is, it’s for a few hours in a day, a couple times a week. It’s not for very long, or else I probably would have gotten him a snuggle buddy to keep him company already. 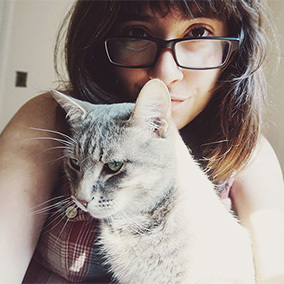 We are still planning on getting Avery a sibling, but won’t until we’re in a house, as we’d like to have multiple rooms so we can have multiple litter boxes and separate the cats if need be; we can’t do that easily at the moment since we’re in a studio flat. But enough of the qualifiers, let’s get into Avery’s daily routine! Starting from the moment the first alarm goes off at 8:00 AM. I have a specific ringtone for alarms where Avery gets food. These alarms go off twice a day – once at 8:00 AM and once at 10:00 PM. He definitely associates the sound with feeding time, and excitedly meows along to the alarm each time it goes off. 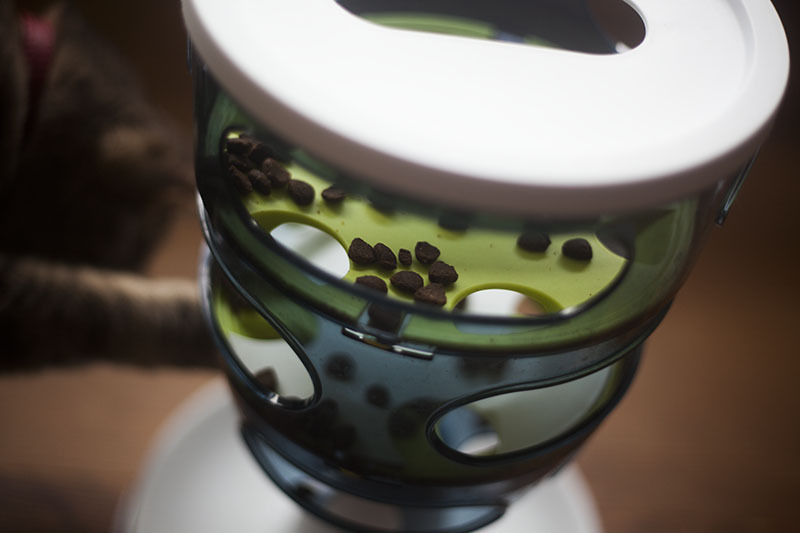 At 8:00 AM, I feed Avery in his Catit Senses Food Tree (reviewed here in case you’re interested). I sprinkle just a little bit of kibble from a jar I will have filled up the previous night after giving him his 10 PM meal. 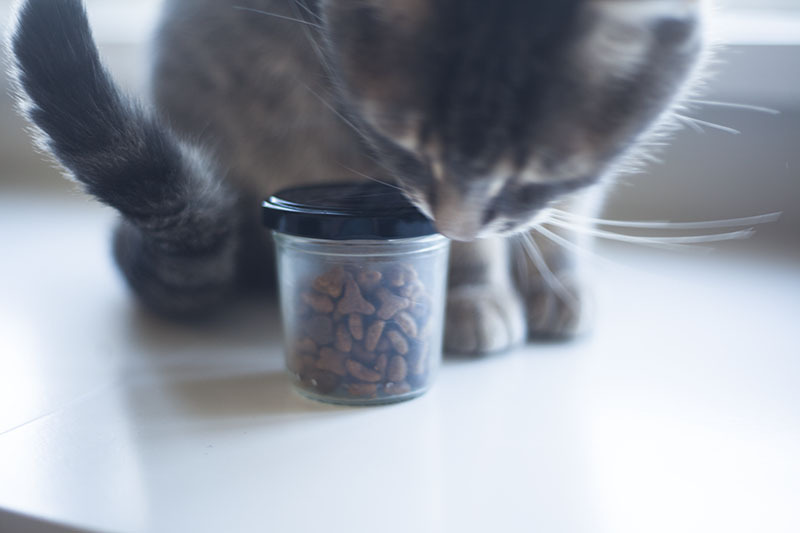 I spoke about this in my article about preventing overfeeding if you’re giving your cat multiple meals and plenty of snacks per day, but basically I measure out one day’s worth of food in a jar, and throughout the day, give Avery from that jar only until it’s finished. So any time I’m talking about giving Avery food, snacks, or meals in this article, keep in mind the fact that it all comes from this one jar. 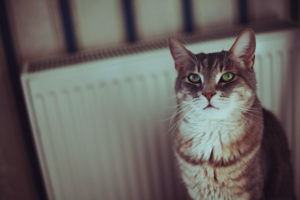 I always ration to make sure I have something left for his dinner at 10, but besides that, I’m pretty generous these days with the frequency I give him food, which you’ll notice when reading the remainder of this article. After giving Avery breakfast, if I’m still tired, I head back off to bed for another hour or two of sleep. Once I wake up for the day, I change Avery’s water, and he usually immediately drinks quite a bit at this point. Avery drinks a lot for a cat, and will typically take huge gulps each time he’s presented with water fresh from the tap. Luckily, he’s never any issues with UTIs in the past, though his cousins (my mother’s and brother‘s cats) certainly have, so I pay attention to his water intake to make sure he’s drinking enough. If I accidentally forget to change the water, Avery will now stand by his mug and meow until I get the picture and re-fill it for him. I always use either a cup or a mug for Avery’s water, never a dish since he seems to prefer the additional height. I’m currently using a Le Cruset Bistro Mug, since it’s massive, really easy to wash, has a wide rim, but also is off-white/cream inside, which I find makes it easier for Avery to see where the water line is. Avery has a habit of sticking his paw into his water to make it ripple before drinking – I think because with metallic colours, with white ceramic inside, or with clear glass, he finds it hard to see where he should be licking to get access to the water. He does this a lot less since we switched to the Le Cruset mug, which I like since it means less mess from the splashing, and in my head, less bacteria from fewer paws going into the water. For around 30 min to an hour after I’ve woken up, I’ll check emails, game (FFXIV! ), or do some odd browsing ’til my husband Thomas wakes up. Avery sits in my lap the whole time, getting the snuggles and petting he’s missed out on while I was sleeping. As soon as Thomas gets up, he starts the kettle for coffee and I give Avery a second round of food – this time by making him go through an exercise workout for it. I’ll place a piece of kibble in my hand, luring him over to the dresser, then another piece with my hand over the bed, having Avery jump back and forth from the dresser to the bed until he’s got no more patience for jumping. At this point, I grab my coffee and sit on the rug for the mental stimulation part of his morning routine. To make it certain Avery will actually engage – I need to involve kibble. So I came up with a game I could use to keep Avery mentally active and stimulated for around 15 minutes after his exercise workout each morning. I hide a piece of kibble under his small green mat, either in the corner or on one of the sides, then point repeatedly at the spot where the kibble’s hidden under, or show him by uncovering the kibble for a second to let him take a peek. 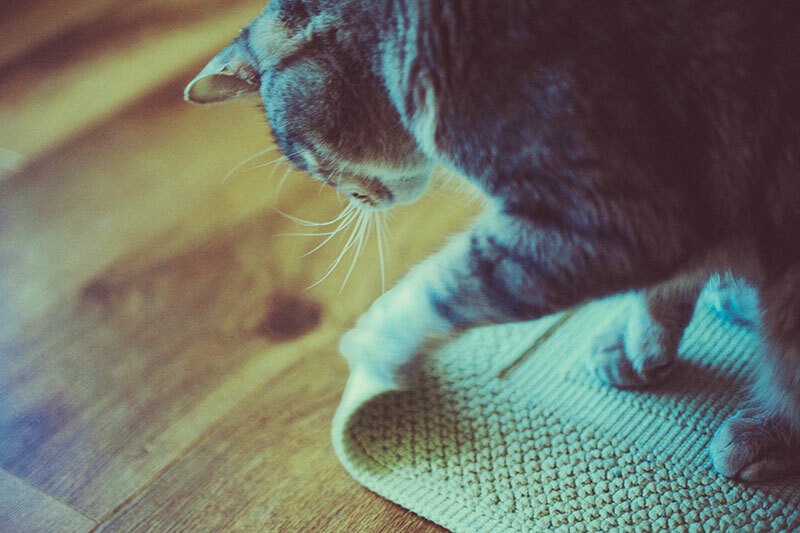 He’ll then attempt to get the kibble out from underneath the mat – using his claws to lift the side it’s beneath, then stuffing his face under the uncovered portion of the mat. He’ll then sniff around until he’s found the kibble, munches away at it, and patiently waits for me to place another piece under the mat. It’s obvious this isn’t a very physical game, but it does the trick for mentally stimulating Avery for some time nonetheless. Once I finish my coffee, the morning routine is over. I’ll take my laptop and go sit in bed where I’ll work for a few hours. Avery will typically join me, taking a nap lying on me, until I’ve completed my work. Once I’ve completed my work, I’ll spend a lot of time doing miscellaneous things, bouncing between my desktop computer (where Avery always joins me by sitting on my lap), the kitchen for meals and/or snacking (where Avery will whine at me to complain about my leaving the room he’s in), and the bed with my laptop or a book (where Avery will again join me by sleeping right next to me). Besides following me around, he’ll often also opt for an afternoon nap in the closet, as we’ve turned the top portion of my closet into a nap-zone by placing a pillow for him on the top shelf and making it easy for him to jump onto it. There are plenty of other places he’ll typically snooze for up to half an hour at a time, like by the window, in our office chairs, or in the Nongshim Noodle Box we leave for him on the dresser. I give him a steady trickle of food throughout the day, usually a piece of kibble every 10 minutes while I’m at my desktop PC, a sprinkle of kibble into his Catit Senses Food Maze when he’s woken up from a long nap, or even another round of an exercise work out if I feel his morning exercise routine was cut too short by him slacking. By doing this, I make sure he’s not sleeping way too much of the day away. Yes, cats are supposed to sleep a lot, but Avery takes the absolute piss if I let him, resulting in him spending the whole night waking me up over and over because he’s suddenly realized he can’t sleep forever. 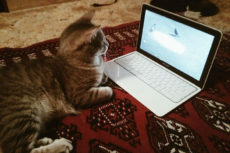 To make sure he (and therefore I) sleep through the entire night, I have to make sure he’s logged in enough “awake” hours during the day, and again, the best way I can assure this is going to happen is to hand over a plethora of snacks over time. 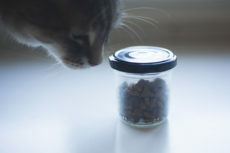 At 10:00 PM, Avery gets fed his (technically) second “meal.” At this point, I dump the remainder of what’s in his feeding jar into the Catit Senses Food Maze, refill the jar for the next day, change his water again (again, if forget, he’ll simply whine at the water until I’ve changed it). Avery will usually take his time eating dinner these days; after that, he’ll have a little rest and then at 11:00, start nagging at me to play with him. 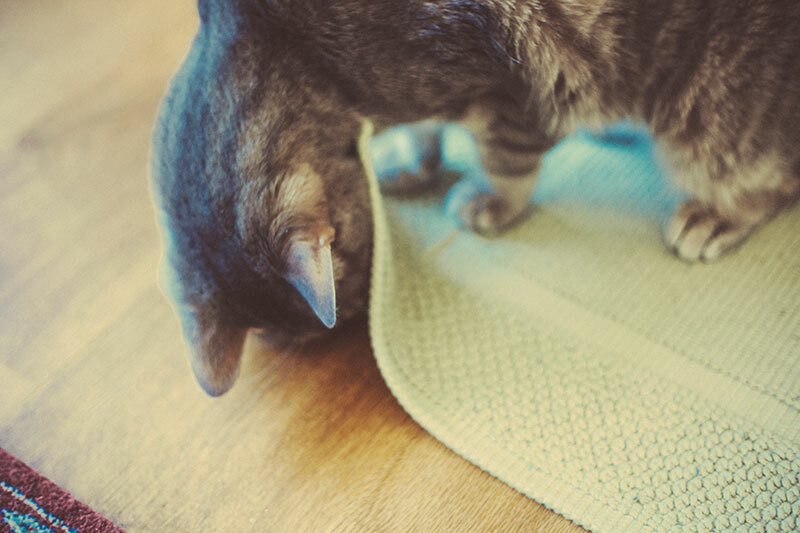 Lately, the only game besides ones that involve food that he’ll engage in is the whole peek-under-the-rug type game. 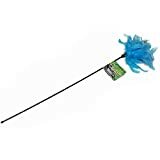 A couple of the Interpet Feather Wands I bought (reviewed here) were pretty much annihilated by Avery over time (bye-bye feathers), so I cut off both ends, and now use the stick portion of the toy to poke beneath the green mat we have for him to play peek-under games with him. 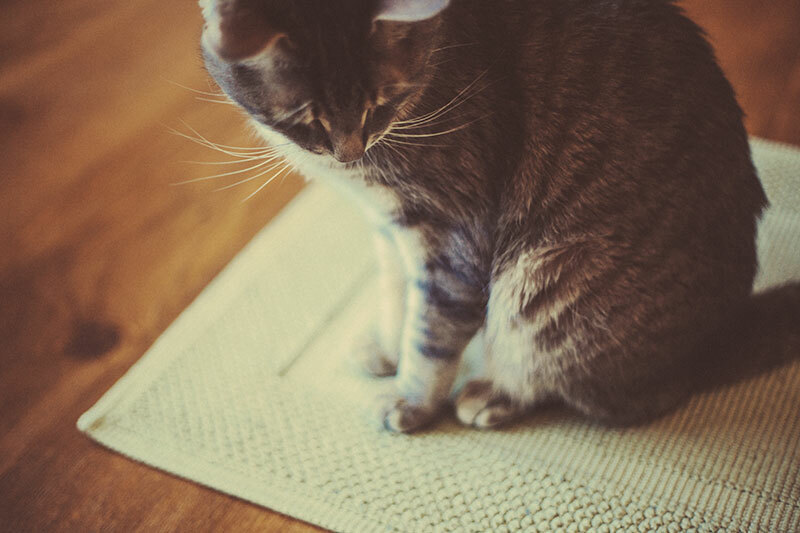 He prefers when I place the mat on top of the rug and poke between, I think because he likes grasping something when he claws at the stick. Avery won’t play at this game for long, but considering I make him do a cat workout by jumping for food each morning, and keep him engaged mentally with the food-under-the-mat game for some time, I’m not all that fussed if he just won’t engage in evening playtime for longer than 2-3 minutes (and yes, this is common). Once the games are over, I head to sleep, he follows me into bed, and the next day we restart the routine over again. What Does Your Cat’s Daily Routine Look Like? 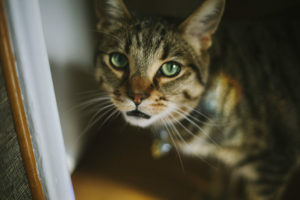 Do you have a house cat or an outdoor cat? Do you have a daily routine? Did you make this routine on purpose or did the routine just come about naturally? 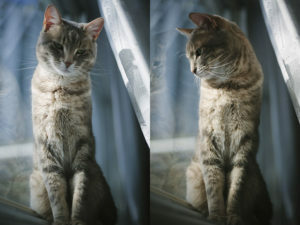 Have you ever tried to create a daily routine for a cat? What was the result? 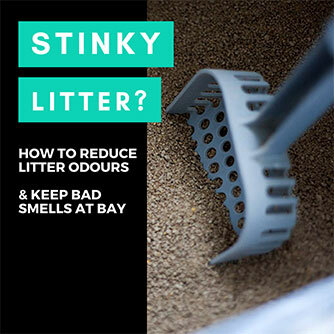 If you haven’t yet, would you ever try making a somewhat fixed daily routine for a pet cat? Why or why not? And of course – what do you think of my daily routine for Avery? Can you spot any ways I can improve it? Really looking forward to hearing your thoughts in the comments! 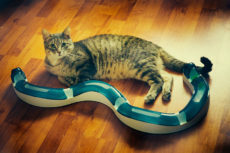 Cat Exercise Toys: Create a Feline Fitness Home Gym! Our two are new, young one adopted 3 months ago and the 6 year old 2 months ago. I wish I had a routine, but am home all day, so they get food whenever I think they want it. I wanted to feed only wet and might get there eventually, but they eat such small amounts that the wet sits there and dries out, plus both cats came here being used to both wet and dry. And I’m not exactly sure what that will be. She just enjoys eating, but I’m wondering whether it is part of her antsy personality. I was concerned about water intake, as they were only drinking from a dripping tap, until someone enlightened me about fountains. We now have two, one up and one on the main floor. I only refresh the water once per week, but daily top it up and completely clean the fountain once per month with a new filter. 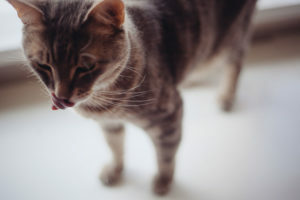 I think a lot of cats prefer dry over wet for some reason and will snack on the dry to the point where they don’t care to eat much wet. It’s the reverse of what I’d expect, but my brother’s cat Beau had to be on wet to keep from getting UTIs and he is really not a fan of wet like dry. Very glad the water fountains work for you! 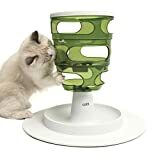 They are wonderful, I’m so glad people keep inventing products that enhance our cats’ lives. 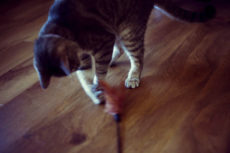 Hopefully something equally perfect will come up on the market to engage cats in playtime – like a realistic electronic mouse or something, haha. You are a good kitty mom . I need to get my cats to be more active. Thank you so much, Ellen! And goodness is it hard to keep cats active sometimes. Feels like you’re fighting against their nature! We used to feed Angel and Chucky only kibble, until Chuck developed (and kept developing) bladder infections and stones, when we switched to all wet food. We feed all cats at around 7 am, between 2-3 pm, and lastly at 7 pm. Our plan is to whittle this down to twice a day. Angel must be separated from the boys, and the boys must be separated from the humans, otherwise they’ll steal all of our food! So, we wake up, put boys in the parlor, and Angel is released from the front room. All cats get fed. Angel goes upstairs, and boys come out downstairs. Sometime during the afternoon, The Hubby feeds everyone again, and usually switches upstairs and downstairs kitties. When I return home from work, I feed everyone, then after dinner I go out for a walk and stuff. When humans go to bed for the night, Angel goes into the front room, and the boys are allowed free-roam of upstairs. Also, I forgot to mention The ‘O’ Cats, whom I feed in the morning and again in the evening, and usually go out there one more time before calling it a night. In the severely cold weather, I don’t do this because they don’t want to leave their toasty shelter or walk on snow. In the summer, I’m outside with them as much as I can. They get a mix of kibble and wet food, just because it’s been working for us. I use kibble as a treat for the inside cats, but very rarely. 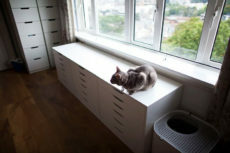 I love your system – something I could definitely see myself doing if I adopted a couple food-thieves like those two! Haha. Oddly enough, I’m sure the switching from one level to the other makes the cats’ days more interesting! Do you think the boys will ever become calm enough to not need to be separated from Angel? Why Is My Cat Crying? Is He Sick? Does He Want Something? Just Vocal?